A Django application for remotely monitoring servers using SSH. Where can I try it ? How do I add my own sensors ? 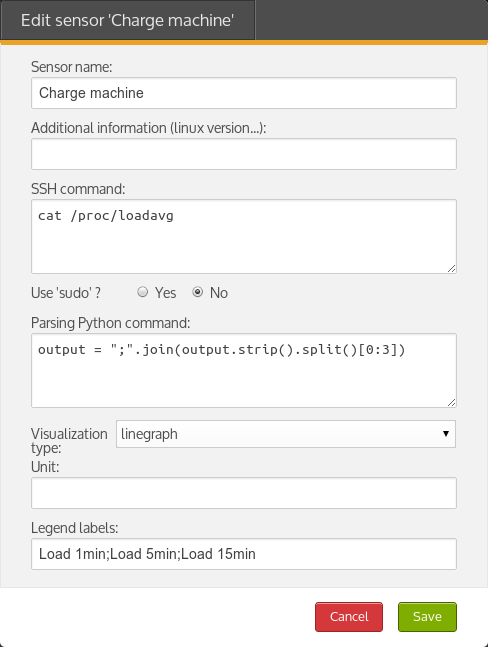 Skwissh is a Django application for remotely monitoring servers using SSH. It uses Python Fabric to launch SSH commands (called sensors) on your servers, get the output, and store the aggregated values into a Django database. The Skwissh Django application is able to display nice charts (line, pie or text) with aggregated measures. You can test our demo site, displaying some sample servers and sensors. Just connect with test / test credentials. First you will need a Django project, check out Django documentation to learn how to achieve this. I strongly recommend using virtualenv while installing Python packages. You're ready to go. Skwissh is ready to monitor. In fact, it has even started to do so ! You can now connect to the application to start customize your sensors and add more servers. Skwissh sensors are easy, once you know what they should return. A sensor is mainly composed of a SSH command and a Python parsing command. As you can easily understand what the SSH command is made for, the Python command is here to help parsing the output and return a good syntax. Measure output expected syntax is mostly comparable to CSV syntax (semicolon separator). This CSV syntax is expected for linechart and piechart sensors. For text sensors, you don't need to parse the SSH command output (if you want the raw text output from your shell command). So you can execute your SSH command, and let the Python parsing 'output = output'. We'll have to store multiple values, here 0.22 0.30 0.31, with CSV syntax. We could use a 'complex' shell command to format this as a CSV string, but as I'm not a 'sed' king neither a 'awk' master, I prefer the use of Python to format measures. So we need to apply the following Python command on the output variable to format the SSH return value. >>> output = """0.22 0.30 0.31 1/517 11628"""  # In fact, it uses fabric. output is now a nice clean CSV value, ready to be timestamped and stored into the database. If your SSH command needs to be executed by 'sudo', just check the box. Additionally, you can add a display unit for your sensor, and also some labels (used for chart legend) in the same order you've extracted your values. Sensors configuration is your responsability ! Don't execute potentially malicious or dangerous commands on your servers ! I can't be held responsible on potential data loss or server damage due to sensors misconfiguration. Additionnaly, when creating sensors keep in mind the execution time of your commands (as sensors are fired every minute). Skwissh application has been developped following responsive design rules. It can adapt to a broad range of devices and browsers, staying easy to read and navigate. Home page displays a list of monitored servers, organized by groups. A server can belong to many groups. This page displays list of configured sensors for current server. You can edit the current server by the 'Options' menu. Linecharts can be filtered on period (last measure or hour, day, week, month period). This page displays list of all available sensors. You can here configure existing sensors and add new ones. fabric SSH Python library from Jeff Forcier (@bitprophet). django-kronos from Johannes Gorset (@jgorset). django-extra-views from Andrew Ingram (@AndrewIngram). jqPlot jQuery plotting and charting library. Zurb Foundation responsive CSS/JS/HTML bootstrap. Having trouble with Skwissh ? You can report issues on the Github page or contact contact@skwissh.com and I’ll help you sort it out.